These days, a couple might choose their wedding date based on the look and feel they want to achieve in their special moment. A pretty spring palette, the dream of mid-summer nuptials, or a winter wonderland can often be the deciding factor for a ceremony and its timing. The availability of friends and family counts too, finding a good moment to gather together, with work schedules and holidays taken into account. Not to mention the influence of venue bookings, and a host of other considerations required to bring the event together, seamlessly. The idea of employing a totally unrelated third party to suggest the date might seem utterly outrageous! Electional astrology is the method used to elect a horoscope – and find a moment in time – that’s most favourable for an event, be it wedding nuptials, a book, album or business launch, even establishing a country, political party or any number of important ceremonies. As an astrologer, it was the single most important element of my own special day; I knew I’d plan to wed with an elected time and date in mind. I was thrilled that the registry office had my preferred slot available, however it’s worth remembering that even the most divinely–timed wedding won’t save a union that’s not built to last. Relationships take work, no matter how good the astrological compatibility –or synastry– may be. So, what does an astrologer look for when picking the perfect wedding date? Each astrologer is unique, and will have a slightly different method for selecting the perfect moment for their client. However they will usually find a time that produces a strong ascendant (or rising sign) for the chart, and therefore a positive ‘chart ruler’, which is the planet governing the sign on the ascendant. They will typically seek a harmonious and happy placement for Venus – the planet of relationships – as well as a comfortable moment for the moon. They’ll look for a positive flow among the planets, offering the couple the best chance at happiness on the day itself – and in the years that follow. Avoiding the dreaded Mercury Retrograde is sensible, as well as the lesser known Venus and Mars Retrogrades. I went to a wedding last August that was held during Mercury Retrograde, and no less than six people had complications arriving – from misspelt names on airplane tickets, to forgotten passports and missed flight connections. To avoid communication and logistical mishaps it’s better to marry outside of these times. Dodge these astrological no-no’s and you’ll already be in good shape! 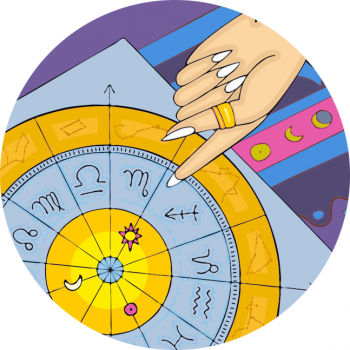 Even the most seasoned astrologer will agree, it’s impossible to find the perfect chart, and ultimately you’ll need to trust your own inner compass – or clock. When you have a rough idea, an astrologer can support you in narrowing down your options, working within the parameters of your suggested time frame. If you come unstuck remember that your official signing ceremony could be quite separate from the celebrations! An elected time gives you the sentiment of the moment and of the marriage ahead, but there are many other factors that affect how two people grow together – through the astrological weather storms of life (‘transits’), getting along as a blend of energies (seen through casting a ‘composite chart’), or developing as an individual over time (ascertained through the progressed chart). If you’ve already tied the knot and are looking back on your own wedding chart, you might think of it as a reflection of your special day, and a flavor – not necessarily the main meal! You can also reflect on the moment you both met, which could hold an even greater significance in your love story.